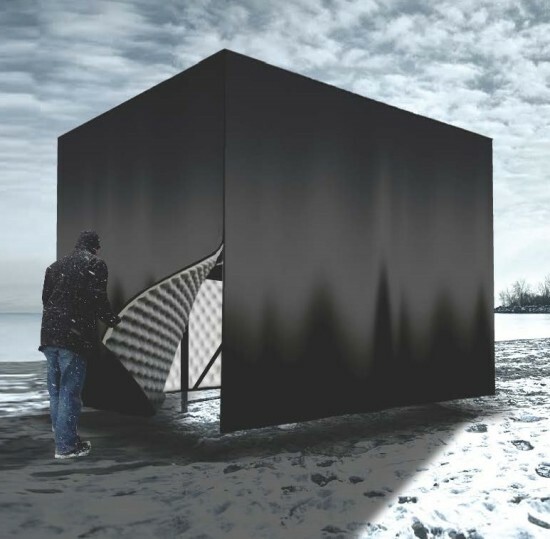 Four winners and three student winners were selected to design art installations along Toronto’s beaches this winter. The concept behind the Winter Stations Design Competition is to enliven typically deserted beaches during the winter with whimsical structures. This year’s theme, Freeze/Thaw reflected Ontario’s harsh climate and elicited playful responses with installations ranging from a fur-lined pod to a fragmented rainbow-hued cavern. The jury received nearly 400 entries from both local and international designers. The seven winning designs will be built from February 10 to 14 along Kew, Scarborough, and Balmy Beaches. Installations will debut on February 15 and will stay open to the public through March 20. “Visitors will discover a feast of textures in the schemes—from vessels clad in charred wood to sailing rope to vintage furs,” Lisa Rochon, senior fellow of Global Cities Institute University of Toronto and a jury chair said in a press release. “Inventive, playful and irreverent, all of the installations can be read like pieces of poetry on the beach. “ The winning designs are: In the Belly of a Bear by Caitlind r.c Brown, Wayne Garrett and Lane Shordee Three Calgary-based artists crafted this charred wood pod lined in thick, warm fur. Visitors are invited to climb in to get warm and enjoy the view from a round window. Floating Ropes by MUDO Described as a “rope forest,” Floating Ropes is a playful take on a permeable cube that visitors can crawl inside to reach a lifeguard chair with views of the lake. Sauna by FFLO (Claire Fernley and James Fox) Two U.K. landscape architects interpreted the “Thaw” theme literally with a tiered sauna. 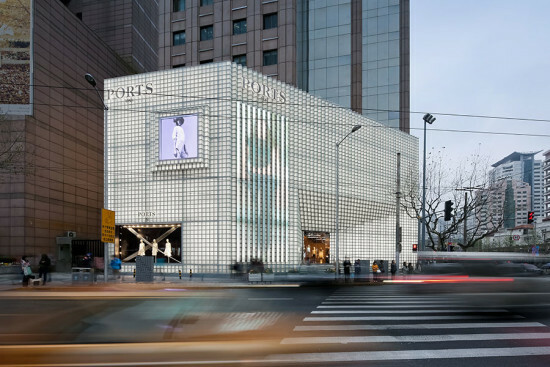 Transparent exterior walls allow glimpses of those within and solar powered lights illuminate it at night. Flow by Team Secret (Calvin Fung and Victor Huynh) Graduate students Fung and Huynh wanted to capture the “transitional moment between freeze and thaw.” They created digitally-fabricated 3-D stars through slot-fitting wood connections that can be easily reconfigured. For the student entries, teams from three schools participated: Lithoform by Remi Carreiro, Aris Peci, and Vincent Hui, Associate Professor, Ryerson University This structure was inspired by frost in the Lithosphere, the outer layer of the earth. The team created a polychromatic cavern around a lifeguard station. The Steam Canoe by OCADU. Toronto, Ontario Project team: Curtis Ho, Jungyun Lee, Monifa Onca Charles, Reila Park, Hamid Shahi, Lambert St‐Cyr, Jaewon Kim, Jason Wong and Mark Tholen, Assistant Professor, Faculty of Environmental Design, OCADU Evacuated solar tubes place at the rear of this “upside down” canoe are designed to melt snow into steam, which creates a halo of fog around the wooden structure. Aurora Borealis by Chris Baziw, Ra'anaa Brown, Trevor D'Orazio, Andrew Harkness, Matthew Hunter, Danielle Kastelein, and Terrance Galvin, Director of Architecture, Laurentian University. Surrounding a lifeguard station, this structure is created from fabric and LED lights on an aluminum and responds to body heat. When visitors touch the illuminated tubes, they change color. “The public participation in Winter's Station's inaugural year proves that even the most overlooked winterscapes can be injected with vibrancy and life," Ted Merrick, lead designer at landscape architecture firm Ferris + Associates said in the press release. "Our ultimate goal for year two remains the same—to encourage the community out of hibernation and back to the beach." On October 27th, the Vancouver City Council voted 5–4 to remove the Georgia and Dunsmuir viaducts, making space for housing, culture, and parks. The viaducts were part of a proposed freeway system through East Vancouver in 1971, until residents protested, and the project was abandoned. In June 2013, the city council made a unanimous vote to study the potential impact of removing the viaducts that connect the downtown to neighborhoods on the city’s East side. Since that unanimous vote, city staff consulted communities and studied traffic. Reports show the viaducts hold six-percent of trips to and from downtown, and it would cost $50 to $65 million to make the viaducts earthquake safe. Mayor Gregor Robertson said in a written statement, "There is no decision at the city that has been more scrutinized, studied, deliberated or consulted on than whether or not to remove the viaducts, and after four years, it is time to move forward." To compensate the loss, a four-lane, at-grade road will be built, adding only one to three minutes in vehicle travel time, while the available land becomes thirteen acres of park space. Also, two city blocks will be preserved for housing, providing 300 below-market units. Although the demolition will cost approximately $200 million, the city anticipates a surplus of $100 million by the time the project is complete in 2025. Previously, Toronto leaders voted to preserve their elevated downtown freeway, prioritizing commute time. International firm Perkins+Will has unveiled plans for a new six story, 210,000 square foot scheme at the University of Toronto Mississauga in Ontario, Canada. The creatively named 'North Building Phase B' has a construction budget of $69 million and is due to be complete by the summer of 2018. The project will be home to six university departments: English & Drama, Historical Studies, Language Studies, Philosophy, Political Science and Sociology, featuring student lounges, study areas and dining space. Part of a wider scheme, it is the second installment of a three-phase program replacing a not-so-temporary structure that was the campus' first building, built in 1967. In terms of its impact on the vicinity, the building will complete a circle of public space that surrounds the campus green creating a more holistic and established area for academia and university life. Notable features of the design, which was granted after Perkins+Will won a two-stage competition, include a terraced atrium that is part of a multipurpose event space, numerous state-of-the-art Active Learning Classrooms, elevated roof gardens and terraces overlooking the campus green for students and staff. The firm has also employed a sustainability focused approach using solar shading and natural ventilation in tandem with clever siting and building orientation. This isn't the first time Perkins + Will has designed for the University of Toronto. The practice has built four other buildings on the university's campus. After more than a decade of planning and three years of construction, Queens Quay in Toronto has been turned into a veritable urbanist's dreamscape on the waterfront. Four lanes of traffic have been reduced to two making room for a separated bike path, separated light rail, benches, thousands of new trees, and extra-wide pedestrian promenades with pavers set into maple leaf patterns. 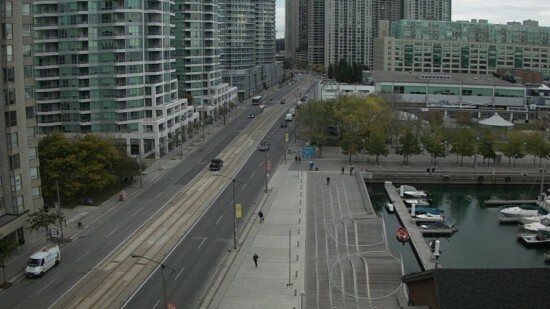 https://www.youtube.com/watch?t=54&v=gIv4dCDfIlc In 2006, West 8 and local firm DTAH, won an international design competition led by Waterfront Toronto to fully reimagine the area. "Once uninviting, the opening of the new world-class Queens Quay, links major destinations along the water’s edge creating a public realm that is pedestrian and cycling-friendly," said West 8 on its website. "It offers a grand civic meeting place and an environment conducive to economic vitality and ground floor retail activity." (In April, West 8 won another Waterfront Toronto competition to reimagine the Jack Layton Ferry Terminal and Harbour Square Park.) In the video above, West 8 explains the massive undertaking, which included significant infrastructure upgrades below the new public amenities. While the long-awaited revitalized Queens Quay has been celebrated and enjoyed by pedestrians and cyclists, the new configuration (notably the reduction of traffic lanes) has been confusing, and frustrating, some Toronto drivers. This learning curve should straighten out soon, though, as the Toronto Star reported that new signs and street markings are on the way to clear up any questions about who and what goes where. Check out the video below, as Toronto Star reporter Stephen Spencer Davis bikes along the Queens Quay. The Toronto City Council will vote on June 21 on whether to remove a one-mile elevated section of the prominent but crumbling Gardiner East Expressway in the city’s downtown. Mayor John Tory wants to rebuild the road, but his staff, including chief city planner Jennifer Keesmaat, are advocating for removing the highway and replacing it with a pedestrian-friendly boulevard. It is unclear what the 45-member council will do. The mayor is advocating what he somewhat dubiously calls a “hybrid plan,” which would rebuild the road with some modifications to its ramps and structure. He told the Toronto Star that "I didn’t get elected to make traffic worse. And let’s be clear, removing that piece of the Gardiner will almost certainly make traffic worse.” Proponents of the teardown want to build a widened road along the city’s waterfront. They say that the mayor is wrong about traffic, as evidenced by Toronto’s successful removal of another section and put in a similar at-grade road. 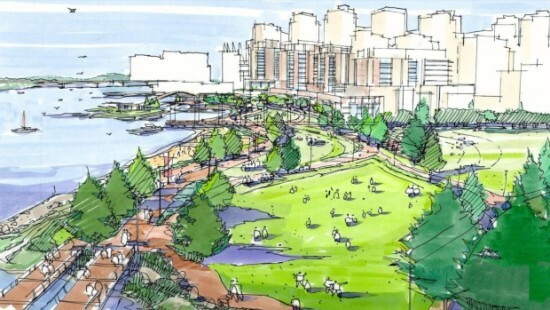 It would compliment the recent plans for the nearby Harbour Landing waterfront, designed by West 8. 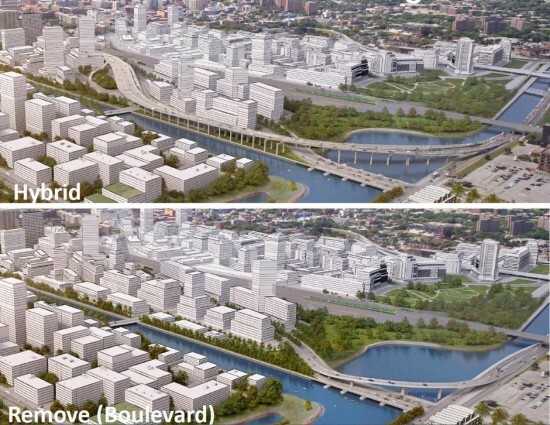 “It’s very clear removing is in the best interest of... [the] long-term vision, as articulated in our official plan,” Keesmaat told a group of landscape architects. “This is an opportunity for us to create a grand boulevard that weaves together the waterfront with the rest of the city, and opens up new development parcels, allowing us to create complete communities within walking distance of the downtown core.” According to polls, 45 percent of residents want to tear down the road, while 33 want to save it. Advocates of the at-grade option say that it will be 96 million dollars cheaper to build, and will save $458 million over the course of 100 years to lower maintenance costs. For the hybrid option, upwards of $100 million would need to be raised just to complete the project. Advocates of removal say that the impacts of their plan are being overhyped. According to experts, only 3 percent of commuters into the core of Toronto use the road. They say that the hybrid proposal would have similar effects on traffic as removal, because in both cases people would find other ways to go, travel at different times, or just avoid the area altogether. Construction on the project would start in 2018. Hey Torontonians, your city’s waterfront might be getting a pretty exciting makeover dubbed a "great green living room for the city." 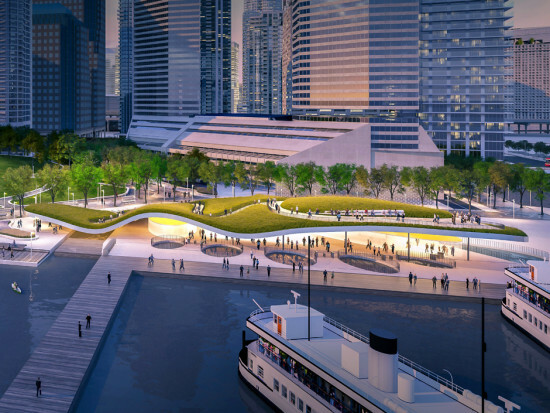 The City of Toronto and Waterfront Toronto have announced that a proposal from West 8, KPMB Architects, and Greenberg Consultants has won its competition to reimagine the dated Jack Layton Ferry Terminal and adjacent Harbour Square Park. In the winning design, named “Harbour Landing,” there is a new terminal with two pavilions set underneath an undulating wood canopy. The whole thing is topped with a rolling, green occupiable roof. The new structure, along with the adjacent park and revamped promenade, are intended to be used year-round and serve as an iconic gateway for the city. “The Jury was impressed by the design balance achieved between a new heavily landscaped Civic Park, an elegant, iconic Ferry Terminal whose naturalistic form echoes the landscape topography and an overarching plan which makes strong connections to the emerging public realm of the waterfront," said jury chair Donald Schmitt in a statement. Of course, the bold design is just the start of what will be a long process. 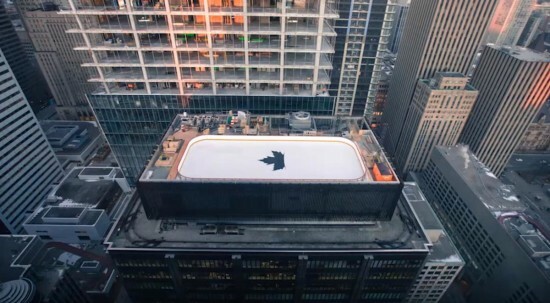 According to the National Post, “Now that a design has been selected, both the board and the City of Toronto must approve it. Designers will then sit down and develop a master plan, which will sketch out the redevelopment in phases. Each one will come with its own price tag.” Currently, $800,000 has been secured for the first phase of the project which is slated to break ground next year. The project’s boosters in Toronto want to see the entire thing completed with 10 years. From the competition website: A playful take on how the iconic deckchair might adapt itself to the cold winter months, Sling Swing is meant to huddle beach goers together in pockets of warmth. The colourful canvases evoke a sense of summer beach nostalgia, while the breeze ensures a continuously animated installation. WMB studio is a London and Liverpool based design collective founded in 2013 with a background in architecture, design and art. From the competition website: Using reused timber, DM_Studio's design transforms the modest lifeguard stand from a simple, discreet metal object into a strong, faceted sculptural form that provides seating and shelter from the winter wind. Founded by Daniel Madeiros, DM_Studio is an emerging London based practice aiming to breach the boundaries between architecture, art and design. From the competition website: Appropriating the tall, swept typology of a wingback chair, this installation creates an over-sized seating structure designed to gather people together. The tall wall provides shelter from northern winds, and a central fire ring will provide warmth in the depths of winter. Tim Olson is a designer whose work ranges in scale from architecture to furniture and art installation. He currently works for the design-build company Bensonwood in New Hampshire. From the competition website: HotBox mimics the typology of the ice house traditionally used in northern climates, heightening the contrast between inside and outside and allowing visitors to experience warmth through visual, auditory, tactile, and associative means. The design was submitted by architects Michaela MacLeod and Nicholas Croft who began collaborating on installations and public art projects two year ago. From the competition website: Snowcone mimics the protective organic form of the pinecone and marries it with the simple, effective technology of the native igloo. 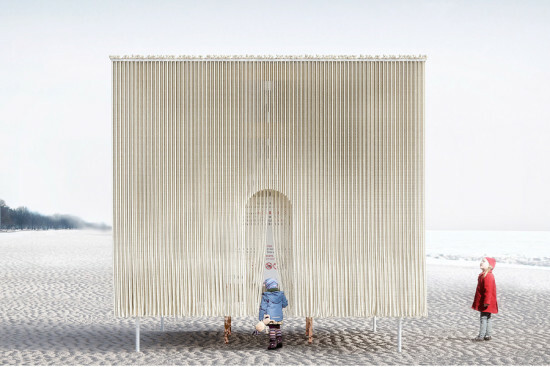 Snowcone was the winning project of a design charette held within the Department of Architectural Science to chose the fifth Winter Station. Fourth-year undergraduate students Diana Koncan and Lily Jeon are leading the design. With 50 pivoting prisms, Toronto-based architecture firm RAW has transformed downtown Montreal into an interactive kaleidoscope. 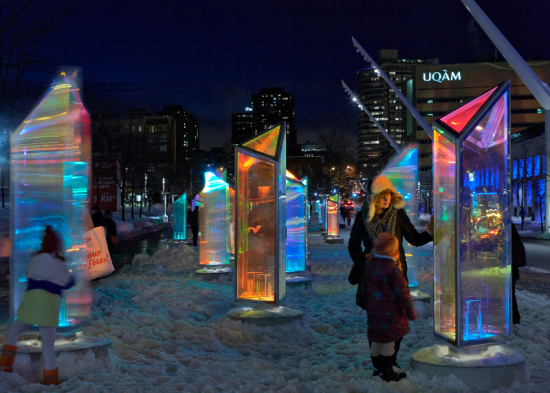 The installation, called Prismatica, is one of two winners selected in the city’s fifth annual Luminothérapie competition. This is the first time that a non-Quebec based firm has won the competition, so congrats to RAW. “The 50 pivoting prisms are made of panels laminated with a dichronic film that transmits and reflects every colour in the visible spectrum, varying with the position of the light source and the observer,” RAW explained in a statement. “The prisms are mounted on bases containing projectors. As visitors wander among and manipulate the prisms, they will enjoy an infinite interplay of lights and colourful reflections. As the prisms rotate, a variable-intensity soundtrack comprised of bell sounds will play.” The director of the firm, Rom Colthoff, added: “We wanted to contribute an installation that was immersive, yet inviting. We wanted people to play around, have fun and, in doing so, forget about the cold.” While impressive, the installation probably isn’t enough to get people to forget about the cold—the bitter, bitter cold. Prismatica is on display until February 1st. 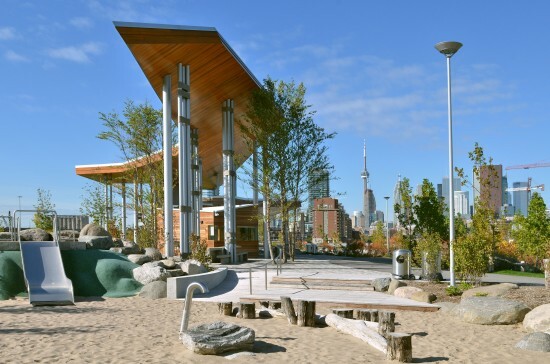 Michael Van Valkenburgh Associates (MVVA) has taken its talents up north to Canada with the new Corktown Common park in Toronto. The 18-acre public space—which is part of the burgeoning, 80-acre West Don Lands neighborhood—was created with Arup and developed by Waterfront Toronto, the government-funded corporation spearheading the revitalization of the city's waterfront. The Common has all the requisite features and amenities to attract Torontonians and their kids to what was, until recently, a brownfield site. Using Brooklyn Bridge Park and Hudson River Park as reference points, the reclaimed space has an array of natural plants, landscapes, ecosystems as well as lawns, athletic fields, picnic tables, play areas, and a pavilion that includes a community kitchen. That can all be seen at first glance, but the $27 million park was built as more than a play area—it was built to work. Representatives from Arup told AN that the park is designed as a “cistern” that stores and treats stormwater to protect the surrounding neighborhood from flooding. This is done through natural elements like plantings, bioswales, a landscaped berm, and a living marsh. But the play areas do their part as well. Water used at the large splash pad, for example, is treated and then directed back through the marsh. “An expansive urban prairie on the berm will respond to changing water levels and frame the more active areas of the park,” MVVA said in a statement on its website. “To the west, lawns, marshes, and woodlands will provide settings for walking, cycling, sledding, sports, sunbathing, and public art, with a multifunction pavilion at the center.” This was all part of a vision to create a park that acts like a cistern, but doesn’t necessarily look like one. This was the team's challenge: mask all the tricks and tools that make the park sustainable within the park itself. “If a mechanical engineer does her job right everything she does should be invisible,” said Jennifer McArthur of Arup.